8oz/240ml size JOCO Cup. A plastic-free reusable glass coffee cup, with a silicone sleeve and lid. Comes in recycled cardboard packaging. 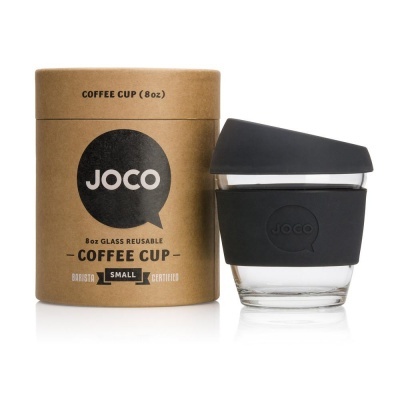 8oz/240ml size JOCO Cup. A plastic-free reusable glass coffee cup, with a silicone lid. Comes in recycled cardboard packaging. 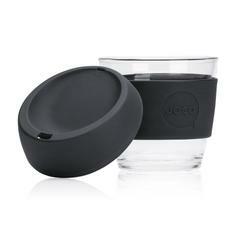 Whether you like a Flat White sitting neatly in your car's cup holder, or prefer your peppermint tea to fit snugly in your palm as you embark the streets, JOCO Cup is the reusable, portable glass coffee cup. Featuring hardened glass, a colourful silicone sleeve and award winning packaging. We are sure that JOCO will be your new best buddy throughout your journeys. The ultimate glass cup, it's so versatile. Not only is JOCO perfect for coffee, but it's great as a drinking glass for absolutely anything. Herbal teas, soft drinks and even perfect for the water-cooler. You wouldn't use your normal ceramic coffee mug or plastic coffee cup for water, would you?